On March 20, 1937, Amelia Earhart attempted a take-off from Luke Field, Hawaii, on the second leg of her first try at flying around the world. The aircraft groundlooped, with substantial damage. This document is the official crash report of that accident, including witness statements and findings. Because of its great length, each segment is presented as a separate file. Click on each thumbnail or link to go to that section. This Document contains both scanned images from the original document and transcribed facsimiles in order to offer searchable text for research purposes. 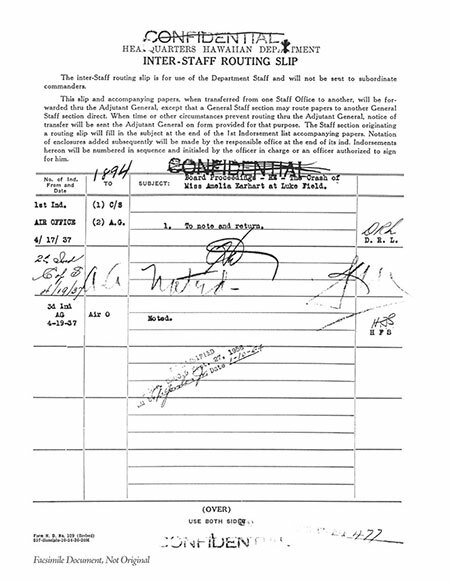 It is not and cannot be taken to be an original document. Where typographical errors occur in the original they have been preserved but are notated. Signatures are facsimiles. 1.) 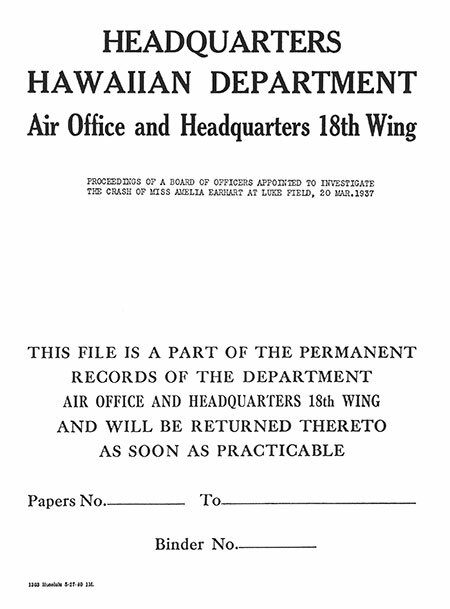 File #334, General Administrative File, 1931-42, Hawaiian Department Air Officer, Records of the U.S. Army Overseas Operations and Commands, Record Group 395, National Archives and Records Service. 2.) Reference: 200.3912-1, Air Force Historical Agency, Maxwell AFB, Alabama; this copy also bears a reference number of B70/6657. While similar in essence, these two sources include slightly different attachments. The first is missing Exhibits L, M, and O, but the file of the newspaper clippings is much easier to read and is more complete. The second is missing pages numbered 1 through 4, has few clippings, but does have a newspaper photograph which the first does not. In order to make a complete fair copy the two sources were combined. The photographs and the newspaper articles are not included here at this time. We are attempting to acquire better images. 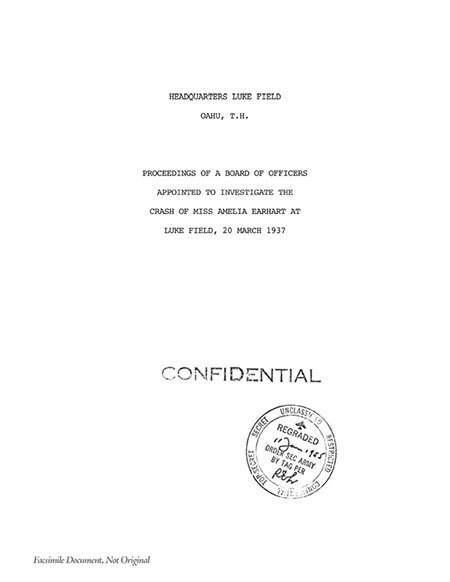 Exhibit "A" Statement by the Engineering Officer, Wheeler Field, T.H. Exhibit "B" "Plan for Amelia Earhart Putnam Flight", Headquarters Wheeler Field, T.H. 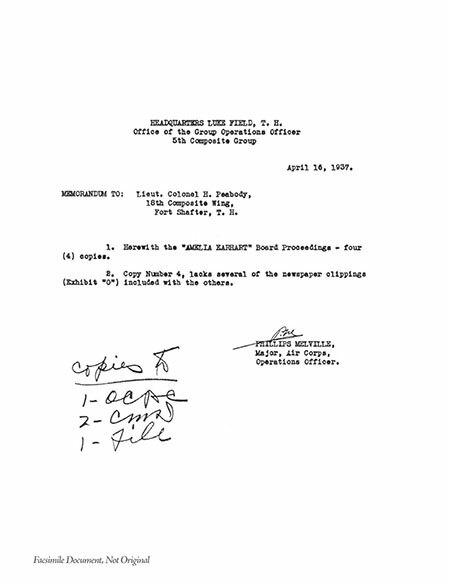 Exhibit "C" Letter, "Amelia Earhart Putnam Flight", Headquarters Wheeler Field, T.H. Exhibit "D" Statement by the Operations Officer, Luke Field, T.H. Exhibit "E" Statement by the Engineering Officer, Hawaiian Air Depot. Exhibit "F" Statement by Mr. Geo. H. Miller, Hawaiian Air Depot. Exhibit "G" Statement by Mr. Fred D. Wood, Hawaiian Air Depot. Exhibit "H" Statement by Mr. E. L. Heidlebaugh, Hawaiian Air Depot. Exhibit "I" Statement by Mr. Lynn V. Young, Hawaiian Air Depot. Exhibit "J" Statement by Corporal E. J. Cashman, R-4311524, 65th Service Squadron. Exhibit "K" Statement by Private E. C. Schultz, 6678961, 65th Service Squadron. Exhibit "M" Inventory of property shipped. Exhibit "N" Request for shipment and release from responsibility.